Word Play – which word do you use? Regularly posted Word Play tips will look at words that are often used incorrectly. Word Play Tip #4: rein or reign? This is not a usage mistake that can be solved by clarifying which is the noun and which is the verb, as both versions can be used as either noun or verb. Rein in/rein back – when a person ‘reins in’ their spending, they are pulling back or restricting how much money they spend. ‘Reign’ is about ruling, as in a monarch. “The reign of Queen Elizabeth II began in 1952.” Today, the word has become more widely applicable to people or teams dominating or at the pinnacle of a sport. For example, Richmond, having won the 2017 AFL grand final, is the reigning premier in the 2018 season. Serena Williams’ reign as the top-ranked women’s tennis player in the world lasted for 186 consecutive weeks and 319 weeks in total. ‘Reign’ can also be associated with a dominating influence or power: ‘Reign of terror’ is a headline we have seen in the media associated with terrorist attacks. A ‘reign of terror’ dominates (or perhaps temporarily rules) a population’s thoughts and fears when it happens. When you need to choose in your writing whether it should be ‘rein’ or ‘reign’, ask yourself if the usage is in the sense of taking control (rein) or ruling/dominating (reign). Word Play Tip #3: licence or license? As with practice/practise, Australian and British English distinguish between this word as a noun (licence) or a verb (license), while US English uses the one spelling (license) for all instances. It is much easier to select which licence/license to use than it is with practice/practise, as the noun is far more commonly used. A ‘licence’ is a tangible thing: a driver’s licence, a fishing licence, a licence plate (on a car), or a business licence. A licence grants you formal permission to do something, often by an authority such as a government or a statutory body. You can have ‘licences’ (plural; more than one licence) or ‘licence’s’ (possessive; the licence’s expiry date is 30 June), but you cannot have ‘licencing’ or ‘licenced’. They are verbs and so for those usages, you ALWAYS need ‘licensing’ or ‘licensed’. ‘Licence’ is also about the freedom to act: a licence to print money, poetic licence, or the footballer was given licence to roam the forward line. You will be hard-pressed to find a usage for ‘license’ beyond the plain form (the infinitive) ‘to license’; to license someone means to grant them a licence to do something – “The Medical Board examines and licenses doctors.” Or “I will license you to drive a car.” A retail store is licensed to sell alcohol, i.e. it has a licence from a licensing authority (such as the Victorian Commission for Gambling and Liquor Regulation). Word Play Tip #2: practice or practise? Australian and British English distinguish between usage of this word as a noun (practice) or a verb (practise). As a noun, ‘practice’ is a tangible thing, like a table is a tangible thing; for example you visit your doctor at his/her medical practice and go to football practice. A process, a habit or a routine (or similar) could be standard practice, world’s best practice, usual practice or customary practice. How to remember the noun/verb versions? ‘Ice’ is a thing, a noun, so ‘practice’ is the noun. People practise things, often to get better at them (sports, skills). It is ALWAYS practising or practised, NEVER practicing or practiced. Word Play Tip #1: issue or edition? Books also can be published in editions (you may see 2nd edition, 3rd edition on the imprint page), which can denote significant content changes over the earlier edition or a new print run with updated cover art. ‘Raikkonen’s wife slams Mercedes over crash’, The Age, 11 July 2018, Sports, page 39. Vettel may have received free rein from the crash, not free reign. ‘Warne questions Paine’s captaincy credentials’, The Age, 15 August 2018, Sports, page 47. Tim Paine may retain the Test reins, not the Test reigns. 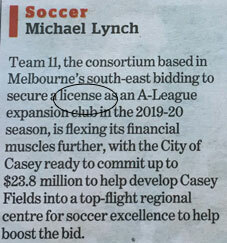 ‘City of Casey backs Team 11 with $23.8m’, The Age, 13 May 2018, Sports section, page 2. The team was bidding to secure a licence, not a license. ‘Banks gag staff to bury the toxic truth’, The Age, 8 February 2018, page 21. 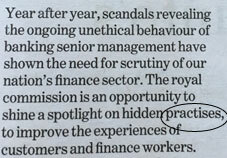 The royal commission was shining a spotlight on hidden practices, not hidden practises. ‘World’s largest plane moves closer to take-off’, The Age, 13 March 2018, page 9. The plane practised rolling down the runway, not practiced. This was almost certainly US wire copy; in the US, ‘practice/practiced/ practicing’ is the spelling for all usages.